I’m not sure if I’m the only one, but when it comes to my perfume collection I obsessively have them categorised; the everyday workwear scent, the weekend scent and the evening/occasion wear scent. Price-wise, I aim for the everyday workwear scent to be on the cheaper end of the spectrum. I find it far more economical to keep the designer fragrances for an evening affair. That being said, I was not only chuffed but very surprised to find that Miss Selfridge sell their own perfumes! How have I only just found this out? To top it off, they retail at just £12 for a 50ml bottle. Bargain. For day to day spritzes, this works out unbelievably cheap. When it’s that inexpensive, it can’t smell amazing, right? Definitely not for Miss Selfridge Beau. I’m one for sugary, sweet scents with a woody base note, and this one ticks all of the boxes. Sounds quite lovely, and I believe it follows through in person. Although the fruity top notes aren’t hugely present, the scents that take control are the warmer violet and jasmine notes, leaving the woody white musks on the skin after a couple of hours. Beau isn’t musky enough for an evening scent however, as the sweetness keeps it light and fresh for daywear. The outer packaging is cute and unique, and the bottle itself looks very sleek and upscale on my perfume shelf. For an Eau de Parfum, I found it lasted a fair few hours on the skin before I had to reapply. It’s not strong enough to last all day, but for £12, I can’t really complain. I managed to bag this while there was a 20% discount offer available as well, so for less than a tenner, this fragrance was a steal. 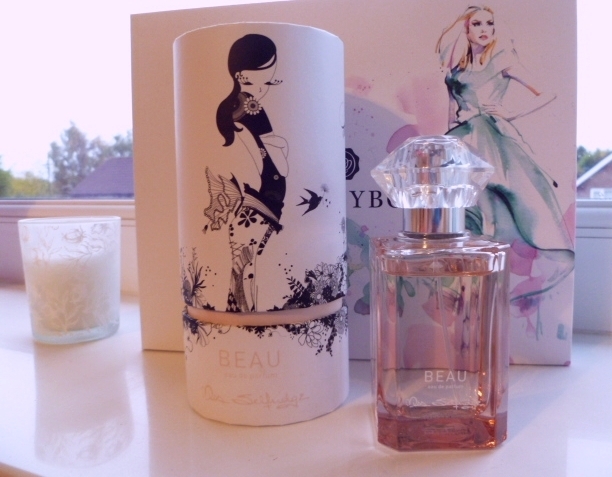 Beau is a pretty fragrance to add to my collection! Have you tried anything from Miss Selfridge’s beauty range?